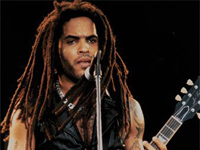 There may have been other “retro” rock acts before him, but Lenny Kravitz was one of the first to not be pigeonholed to a single style as he touched upon such genres as soul, funk, reggae, hard rock, psychedelic, folk, and ballads over the years. Born in New York on May 26, 1964 (his mother was actress Roxie Roker, best-known for her role as Helen Willis on the popular TV series The Jeffersons, and his father was a TV producer), Kravitz was raised in Los Angeles, where he found himself around countless musical giants as a youngster due to his parents friendships with the likes of Duke Ellington, Sarah Vaughan, Count Basie, Ella Fitzgerald, Bobby Short, and Miles Davis. Kravitz was a member of the California Boys Choir until his teenage years, when he decided to pursue rock & roll while in high school and under the heavily influence of funk rocker Prince. Kravitz’s admiration of the Purple One was so great that he at first patterned his style and approach directly after Prince and became known as “Romeo Blue” (complete with blue contact lenses), but failed to land a recording contract. What should have been a time of happiness for Kravitz quickly turned sour as he and Bonet divorced by the early ’90s. Kravitz’s heartbreak was very evident in his sophomore effort, Mama Said, which was even stronger than its predecessor, highlighted by the Led Zep-like funk rocker “Always on the Run” (a collaboration with Guns N’ Roses guitarist Slash), as well as the mega hit with the Curtis Mayfield-esque soul ballad “It Ain’t Over ‘Til It’s Over,” which confirmed that Kravitz’s success was no fluke. But the best was yet to come for Kravitz. His third release overall, 1993′s Are You Gonna Go My Way, is often considered to be the finest album front to back of his entire career, and with good reason: Every single song was a winner, including the up-tempo anthemic title track, which turned out to be one of MTV’s most played videos for that year. The album was a massive hit and Kravitz became an arena headliner stateside, as well as being featured on countless magazine covers. Despite an almost two-year gap between albums, Kravitz’s fourth release, Circus, came off sounding unfocused and was a major letdown compared to his stellar previous few releases. Perhaps sensing that he needed to stir things up musically, Kravitz dabbled with electronics and trip-hop loops for his next album, 1998′s 5. Although not a huge hit right off the bat, the album proved to have an incredibly long chart life, spawning the biggest hit of Kravitz’s career, “Fly Away,” almost a year after its original release. With the single’s success, Virgin decided to cash in on the album’s sudden rebirth by reissuing it around the same time with a pair of extra added bonus tracks, one of which became another sizeable hit single, a remake of The Guess Who‘s “American Woman” (which was used in the hit 1999 comedy movie Austin Powers: The Spy Who Shagged Me). Kravitz’s first best-of set, the 15-track Greatest Hits, was issued as a stopgap release in 2000, while his sixh studio release overall, Lenny, was issued a year later. Baptism followed in 2004. After starting a residential, commercial, and product design company called Kravitz Design, he recorded a funky version of John Lennon‘s “Cold Turkey” for Amnesty International’s 2007 benefit compilation Instant Karma. Before the end of the year it was announced that Kravitz would return in 2008 with a new album, It Is Time for a Love Revolution. The album arrived in February, accompanied by a brief tour.